People take hairstyles very seriously. Hair is often an important factor in how people judge your appearance and people often go to great lengths to make certain they look terrific. It’s the reason you’ll see so much money spent on stylists and hair products. Used properly, hair products such as coloring dye or bleach do make you look unique, but you need to be careful. When you use them improperly, you could damage your hair to the point where you will see hair loss. At RHRLI, we want to tell you about this and all types of hair loss. RHRLI is the only hair treatment center on Long Island that has the best permanent solution to hair loss you can find on the market. It’s called the ARTAS® system and it uses robotic technology to give you the best hair transplant out there. We want you to know about all types of hair loss and we want you to know about how hair coloring can be related to hair loss. According to the Washington Post, you can damage your hair with bleach and dye. They explain that hair gets its color from a pigment called melanin. There are two types: eumelanin makes hair dark while pheomelanin makes hair red. Blond hair has any combination of the two, but in lower levels of melanin. When the hair totally loses melanin, it looks white or gray. When you use permanent dye to color your hair, it opens up the shaft and breaks down the natural pigmentation. Lightening your hair is getting rid of your pigments. When this happens the bleach breaks down the natural fatty acids and weakens your strands. That’s why you need to go easy on bleaching your hair too much. There are other ways you can give your hair some TLC. WebMD suggests considering gentler dyes, such as vegetable-based dyes, cellophanes, and hennas. You should also consider asking your stylist about products that are ammonia and peroxide-free. If you dye your own hair, look for products that have less than 20 percent peroxide. Another excellent solution is to buy semi-permanent hair coloring. If you find that the temporary hair dye doesn’t cover your gray hair, consider applying permanent color at the roots and semi-permanent color on the rest of your hair. Read the label carefully and don’t leave your dye on your head any longer than the recommended time, even if the color doesn’t take. When you apply hair dye, start at the lower ends and work your way up to the roots. Get a deep conditioning before you color your hair and avoid combing, brushing and blow-drying your hair after you’re done dyeing your hair. 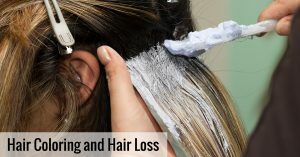 More often than not, losing hair due to bleach isn’t permanent but it can become impossible to reverse if you continue to use too much. If you are looking for a lasting solution to hair loss, RHRLI and ARTAS® have it. This minimally invasive procedure uses robotic technology to search for and harvest healthy donor hairs and then transplant them with precision. To learn more contact us today. Previous Post: « Are Hair Transplants Painful?